Tired of waking up tired? Do dark mornings and stress make it worse? Allow us to help. We’ve singled out 11 of the best free sleep apps to make getting to the land of nod smooth sailing. Because, as we already know, sleep is a big part of productivity as well as health. We’ll share our top picks of apps to help you fall asleep faster and stay asleep longer. But first, a note on tech and sleep. Because this isn’t always a perfect pair. Now we confess: Technology and sleep have a complicated relationship. Lying in bed glued to your phone is only going to keep you awake. That’s why it’s important to set up a healthy nighttime routine and make sure any sleep app you use is a tool, not a distraction. Let’s put it this way: If you’re using an app to set an alarm or hit play on a meditation track, do only that and then put your phone back down. If you use an app to journal and get out your thoughts, to write out a plan for the coming day, or to do anything else that takes more time, make it a habit to do these things an hour or two before bed. Or use a tech-free tool like Panda Planner to get your thoughts and plans on paper and out of your brain. Keep to those guidelines and you can make these free apps to help you sleep work for you. No more counting sheep. Just relaxing into a good night’s sleep. These apps to help you fall asleep approach a good night from a variety of perspectives—from quieting your brain to tracking your hours. The best part? You can get all of the functionality free of charge. And while some apps offer upgrades or monthly subscriptions, we’re focusing on the features that come in the free versions. So you don’t have to sacrifice money for sleep. Tide has a light wake-up alarm that nudges you awake during your lightest sleep phase (monitored during a window of time you select). One of its other great features is a set of calming breathing exercises, where your inhalations and exhalations are guided by sound. Over 30 million people have downloaded this app, and we’ve gotta say—it’s popular for a reason. A beautiful interface and stellar functionality intersect to put Relax Melodies high on our list of favorite free sleep apps. Create your own sleep soundtracks by mixing nature sounds, melodies, white noise, and even binaural beats. Still not catching z’s? Mix in a guided meditation track to really get you snoozing. Relax Melodies’ free version includes dozens of sounds and several meditations. Other unique features—like guided breathing and pre-sleep relaxation exercises—are available only by upgrade. Minimalists rejoice because Sleepo is one of the few free sleep apps that truly keeps things simple. What does it do? Lulls you to sleep with relaxing sounds. Nothing more, nothing less. We love Sleepo not only because it does one thing and does it well, but because it gives you virtually all of its functionality for free. There are 32 sounds you can mix together—from rain to melodies to white noise—and you can run the soundtracks you create on a timer, or all night long. One caveat: Sleepo is for Android only. Meditation isn’t just for the spiritually ambitious yoga devotee. Anyone carrying the stresses of daily life with them to bed each night can benefit from a calming voice guiding them to relaxation. Since we’re going for free apps here, we can’t go past Insight Timer. With over 12,000 meditations available, it claims to have the largest free library of meditations on earth. And there’s no shortage of those aimed at helping you sleep. Add to that plenty of flexibility—like a customizable meditation timer with various starting bells—and Insight Timer has no downsides we can think of. You can purchase extras like 10-day meditation courses, but the app remains fully functional for free. Snoring not only drives your significant other up the wall, but it can also be a sign that you’re getting subpar sleep. Enter SnoreLab, one of the best free sleep apps specifically for snoring. The app records your snoring during the night and gives you a detailed report in the morning. You can link this data to different factors, like whether you drank a few sneaky beers before bed, or ate a particularly heavy meal. The app also lets you track different remedies so you can find what works for you. Not all analytics are available in the free version, but it gives you a great starting point to determine what helps and what hinders your snoring situation. It’s worth a shot: Your health (and your partner) will thank you for it. Sleep Cycle monitors your movements as you sleep, using your phone’s microphone. Armed with this information, it can wake you up when you’re in a lighter phase of sleep (meaning you’ll wake up more easily, aka, you’re less likely to need a bucket of coffee just to function). Simply set an alarm “window,” and the app will ease you awake at the best time during that range. The app also gives you sleep graphs and statistics of your night’s sleep. Detailed trends on the data are only available to premium members, however. Pillow is one of the best iPhone apps for sleep that monitors your nightly rest. Set up your phone by the bedside (as with most sleep tracking apps, it’ll have to stay charging), and head off to dreamland. In the morning—after being gently woken by a smart alarm—you’ll get a report on how long you slept with a breakdown of time in each sleep phase. You can also track notes on different pre-sleep activities (like if you ate late or read a book) to see how they impact your sleep quality. Sleep tracking and alarm are free with Pillow. The premium version gives you access to long-term trends, sound recordings, and Apple Health integration. 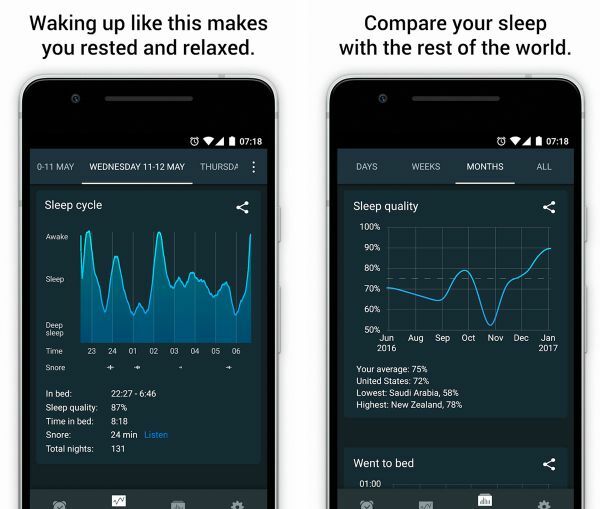 Don’t worry Android users, we have free sleep apps with tracking capabilities that are only for you as well. Enter PrimeNap. This app comes with sensor-assisted sleep tracking and an activity log so you can see how your day’s choices affect your sleeping patterns. Extra bells and whistles include a screen dimmer, sleep sounds, and dream journal. We like that the free version lets you do plenty of stuff. If you do choose to upgrade, you also get a sleep cycle alarm clock with over 40 customizable parameters. The blue light from your devices can disrupt your circadian rhythms and keep you awake (so say various studies, such as this one). Ideal solution? Stay off your phone for a few hours before bed. Next best thing (because you just can’t help yourself)? A blue light filter. iPhone owners can use the inbuilt Night Shift feature, which automatically adjusts the screen color as the sun goes down. And while Android devices often have their own version, there’s a chance yours doesn’t. Or that you’d prefer a full app with more control over the settings. 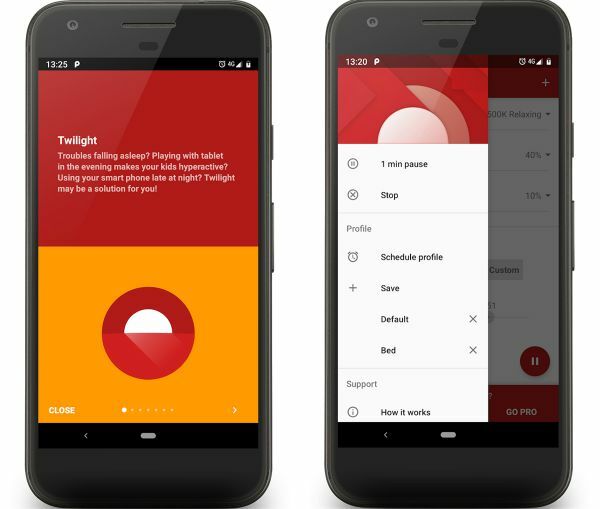 Try Twilight: It filters the color spectrum of your phone or tablet depending on the time of day, helping to protect your eyes and your sleeping patterns. It’s flexible, easy to use, and lets you create multiple profiles with different settings for each. Sometimes sleep doesn’t come because your mind is just too busy to let it in. All those thoughts floating around, all those stresses? You need to get them out of your head. That’s where a simple journaling app can come in handy. Perspective lets you track your moods alongside notes about what’s on your mind. It’s a great way to reflect at the end of the day because you can see how your moods relate to different activities. In other words: What things should you be dedicating more time to in order to feel happier? Uniquely, Perspective shows your journal entries across a big-picture “life calendar” that displays every week between when you were born and your 90th birthday as a tiny color-coded square. Sounds kinda daunting, but we have to admit—it does give you a different perspective. Unfortunately for Android users, Perspective is available on iOS only. Who doesn’t love a good nap? Naps can give you a burst of new life. They can help you refocus. Naps can even boost your productivity. While some of the other free sleep apps on this list can be used to set alarms for naps, you might want one that’s dedicated to the art of the quick snooze. That way you can just open the app, set your desired nap length, and away you go. 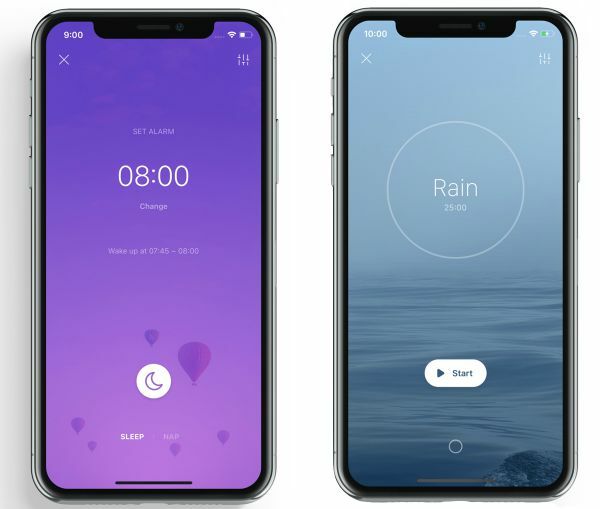 Power Nap is super simple to use, has inbuilt movement tracking so it can monitor and report on your naps, and has a catalog of nature sounds you can gently wake up to. It’s also one of the few sleep apps that’s completely free, though note that it’s for iOS only. Your turn: What one of these free sleep apps are you most likely to try? Do you have other suggestions for us? Tell us all in the comments. Need more ways to chill out asap? Try an 8-minute guided meditation to ease into spring and out of stress.